SAN FRANCISCO (February 1, 2011) – Expanding its innovative, award-winning line of vodkas made with all natural ingredients, SKYY® Vodka introduces new SKYY Infusions® Dragon Fruit and SKYY Infusions Blood Orange – the first of their kind available nationwide. Inspired by exotic locales and current culinary trends, these new infusions blend authentic dragon fruit and blood orange with SKYY’s premium distilled vodka, creating two alluring, distinctively different spirits. All Natural SKYY Infusions Dragon Fruit, which has already been awarded a Gold Medal by the prestigious Beverage Testing Institute of Chicago, and SKYY Infusions Blood Orange join the brand’s existing line of unexpected flavors, which includes Pineapple, Ginger, Cherry, Grape, Citrus, Raspberry and Passion Fruit. SKYY takes the vodka category in a bold, tantalizing direction with the introduction of All Natural SKYY Infusions Dragon Fruit – an all-new superfruit experience. An upgrade from acai and pomegranate, dragon fruit is a superfruit that boasts a unique and unexpected flavorful taste direct from a lush rain forest. An intoxicating blend of premium vodka and real dragon fruit, this latest SKYY Infusions variety offers an exotic cocktail experience reminiscent of the fresh, sweet taste of juicy red berries. As indulgent as it is stunning, the dragon fruit heralds from South America and Asia, but appears as if it has been grown and picked right out of a mythical world. The dragon fruit has a dark pink rind dancing with green and yellow tendrils. Once sliced, an unexpected white or pink fleshy interior with tiny edible seeds becomes visible. The dragon fruit’s multifaceted flavor profile is quickly replacing more mainstream fruits, with non-alcoholic dragon fruit juices and flavored waters popping up in markets nationwide. 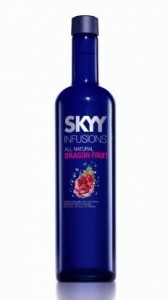 All Natural SKYY Infusions Dragon Fruit exudes a bold, sweet taste with the tantalizing aroma of candied tropical berries, followed by a wave of exotic fruits and a complex blend of savory spice and zest. All Natural SKYY Infusions Blood Orange is an alluring blend of premium SKYY Vodka and real blood orange, displaying the natural sweetness; deep, refined complexity; and mouth-watering juiciness of the sinful blood orange. It has an enticing aroma of sweet orange zest followed by hints of spice and caramel. Native to Italy and Spain, the blood orange’s unusual crimson-colored flesh embodies a delicate balance of sun-drenched succulent juiciness and complex bittersweet flavor, creating a multi-sensory taste experience bursting with the essence of sweet, fresh oranges. Both All Natural SKYY Infusions Dragon Fruit and SKYY Infusions Blood Orange will be available nationwide starting in February in 50ml ($1.99 MSRP), 750ml ($18.49 MSRP) and 1L ($26.49 MSRP) sized bottles. The launches will be supported by a fully integrated marketing campaign featuring advertising, social media activities and on-/off-premise promotions. All Natural SKYY Infusions, the line ranked #1 in taste by the Beverage Testing Institute (BTI), was originally launched in five flavors – Citrus, Cherry, Grape, Raspberry and Passion Fruit, in April 2008 by Skyy Spirits. A year later, SKYY introduced SKYY Infusions Pineapple, which quickly became a nationwide centerpiece of classic and contemporary Tiki cocktailing. In 2010, SKYY Infusions Ginger, another BTI Gold Medal winner, made its debut, making the delectable, sweet taste of ginger readily available to any bartender or consumer. With the introduction of its eighth and ninth Infusions, SKYY Infusions Dragon Fruit and SKYY Infusions Blood Orange, Skyy Spirits continues its high standard for ultra-premium, all natural infused vodkas developed on the principles of quality, innovation and style. The entire SKYY Infusions collection can be enjoyed simply on the rocks, with club soda, with 7UP® or in a myriad of other delicious, sophisticated cocktails. Learn more at http://www.facebook.com/SKYYVodka or Twitter: @SKYYVodka. Skyy Spirits, LLC is the US-based wholly owned subsidiary of Gruppo Campari (Reuters CPRI.MI – Bloomberg CPR IM) and is the eighth-largest spirits company in the US. Launched in 1992 with the introduction of its flagship brand, SKYY® Vodka, Skyy Spirits has grown exponentially, building a portfolio unrivaled in its quality, innovation and style, making it a top choice among distributors, retailers and consumers. Skyy Spirits manages Gruppo Campari’s portfolio in the US of such leading brands as SKYY® Vodka, SKYY90®, All Natural SKYY Infusions®, Campari®, Wild Turkey® Straight Kentucky Bourbon, American Honey®, Russell’s Reserve®, Glen Grant® Single Malt Scotch Whisky, Cabo Wabo® Tequila, Espolón™ Tequila, Ouzo 12®, X-Rated® Fusion Liqueur®, Frangelico®, Carolans Irish Cream®, Irish Mist® Liqueur and Jean-Marc XO Vodka®. Skyy Spirits is also the exclusive US distributor of Cutty Sark® Scotch Whisky, The Glenrothes® Single Malt Scotch Whisky, Bowmore® Islay Single Malt Scotch Whisky, Auchentoshan® Lowland Single Malt Scotch Whisky, Glen Garioch® Highland Single Malt Scotch Whisky, Flor de Caña® Rum, Midori® Melon Liqueur, Hibiki® Whisky and The Yamazaki® Single Malt Whisky. Skyy Spirits was founded and is headquartered in San Francisco, California. More information on the company can be found at www.skyyspirits.com, www.facebook.com/skyyspirits, Twitter: @SkyySpirits and www.camparigroup.com. Please enjoy Skyy Spirits brands responsibly and in moderation.